Ursula Rivata was born on July 12, 1897 at Guarene, Italy. Her mother died early in her childhood but Ursula was well prepared to live the consecrated life she sensed God was calling her to. At 20 years old she received an enticing marriage proposal; however, she simultaneously felt drawn to respond to her calling the following words: “You alone, Lord, and that’s that!”. Ursula’s encounter with Father Alberione was decisive in her future life and mission. On November 21, 1923 Father Alberione selected two women, among them Ursula, for a mission. When asked about their mission, Father Alberione simply replied: “You will carry out silence, silence, silence”. In the beginning of the following year, the Founder gave life to a new Institute, the Pious Disciples of the Divine Master. 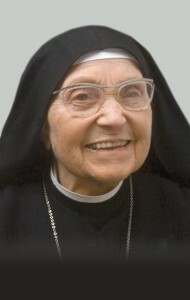 Ursula received the name of Sister Scholastica and was assigned as the first Mother of the Institue. Mother Scholastica was deeply drawn to the Holy Eucharist. Her daughters testify that even throughout her advanced years, when she was physically slowed down, she would adjust her schedule and increase her Eucharistic prayer. She is also recalled for having a joyful smile. With much faith, prayer and strong adhesion to the will of God, Mother Scholastica’s mandate lasted 20 years, involving many trials and humiliations. O Jesus, our only Master, Way, Truth and Life, we praise and thank you for your Disciple Sister Mary Scholastica Rivata. Sustained by the Holy Spirit and with the strength of the Eucharist, in the joys and sorrows of daily life, she said yes to the will of the Father. In the footsteps of Mary, your Mother and ours, she has offered herself with joy to the service of God and neighbour. May her example help us to choose the way of the Gospel in every circumstance of life and through her intercession grant us the grace we ask of you. Amen.